Vertical lift storage systems are designed to help companies and organizations achieve maximum efficiency and productivity in materials storage and management. Materials are stored vertically, freeing up floor space for other uses. Software is used to locate and deliver items quickly, eliminating the need for employees to search for items or retrieve them in potentially dangerous ways. 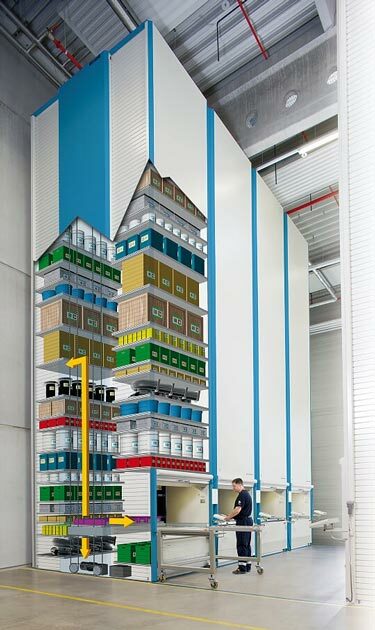 Vertical storage is used across many industries, including manufacturing, healthcare, automotive, military, government, aerospace, medical technology, electrical and mechanical engineering, aircraft, pharmaceutical, mail-order and e-commerce fields. BSC’s ultra-energy efficient lean-lift vertical lift model (VLM) systems store materials safely and securely. 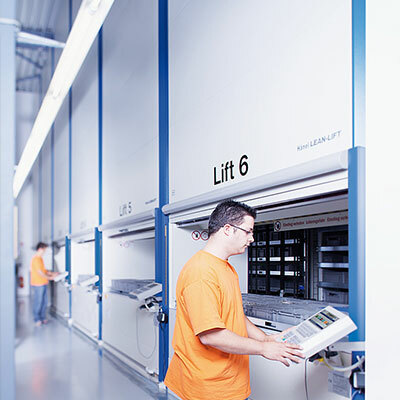 BSC is especially proud to offer the Lean-Lift vertical storage system by Hänel. When an item must be retrieved from a traditional storage system, it can take a great deal of time for an employee to walk up and down aisles, searching for the correct item. Mistakes can be made, leading to additional lost time in returning the incorrect item and re-shipping the right one. Companies and organizations lose a great deal of productive work time to searching, retrieving, and employee errors. With traditional shelving, employees must use ladders or lifts to retrieve items that are stored on tall racking, and they must lift heavy parts or objects. Employees are at risk of acute injury as well as repetitive strain injuries as they carry out climbing and lifting duties on a regular basis. In addition to the harm to the employee, injuries lead to lost work time, low productivity, and costs to the employer. Traditional, fixed shelving wastes a great deal of space. Dead space is left between shelves, more rows are required when vertical space is not used, and additional aisle space is required. The more rows of traditional shelving that are needed, the larger the storage facility must become. Switching to a vertical storage system can increase organization of inventory and materials and eliminate wasted space between shelves and between rows, releasing that floor space for other activities. 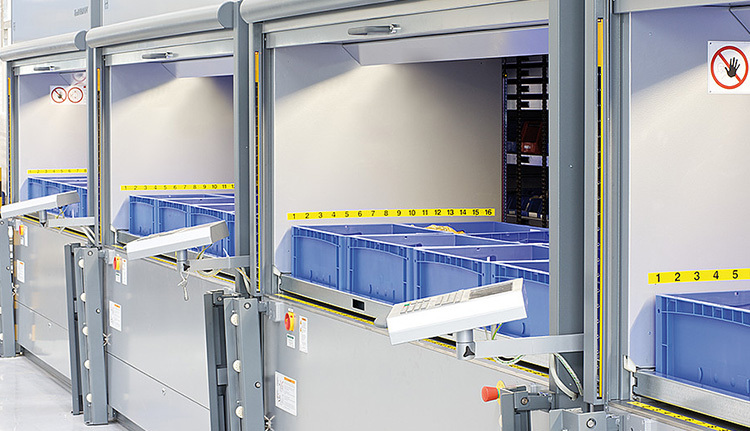 When the vertical storage system offers automated retrieval, the advantages are even greater. BSC is proud to offer the innovative Hänel Lean-Lift. This a high-quality, high-tech system is used for vertical storage organization and materials management. The Lean-Lift is a cost-effective, efficient, and flexible product that offers many significant advantages over traditional shelving systems. Software is used to track the exact positions of all items being stored, and the extractor automatically stores items in their designated container or retrieves them by delivering the correct container to a retrieval area. Items are also delivered at an ergonomically correct height. It’s easy to expand or rearrange storage, and initial installation of the Lean-Lift is straightforward. The Lean-Lift’s vertical lift modules free up floor space by using available room height to store inventory and materials. The extra floor space could house additional materials or be used for other purposes. Many businesses and organizations that have high storage needs struggle with space concerns, and adding vertical storage is a great way to increase capacity in a building without bearing the cost of additional construction. The Lean-Lift’s innovative design can increase available storage capacity by up to 60%. The Lean-Lift goes beyond just using the available room height to increase storage space. It stores materials in height-optimized shelving positions so that no space is wasted between shelves. Shelf heights are dynamically adjusted by the system to accommodate the sizes of stored items and containers, achieving very high-density storage on a small footprint. If more storage space becomes necessary, it’s easy to install additional lifts. The structure is easy to use and to adjust to a facility’s particular operational needs. The Lean-Lift’s picking speed and accuracy lead the industry, allowing employees to decrease their access time significantly. The Lean-Lift delivers the requested item automatically to the access area within seconds. Productivity increases as staff hours and picking time decrease, and accuracy in retrieval improves significantly with the Lean-Lift system. Energy efficiency is also achieved in models that use various levels of automatic standby and shutdown. Rather than the person going to the item, the item is brought to the person. This retrieval system eliminates walking, stooping, reaching, climbing ladders, riding on lifts, and carrying heavy or bulky items. The Lean-Lift’s design also minimizes repetitive strain for employees as items are picked and delivered to the optimum ergonomic height for the employee. The Lean-Lift controller works with an inventory management system that can improve inventory accuracy to over 99%. Employee errors in picking are eliminated, as are overstock, shortages, and expired stock. The Lean-Lift is a lockable, enclosed unit with optional password access, keycards, and RFID options. Materials are stored securely in a dust-free area. Traditional shelving systems can result in injury, inefficiency, errors, and losses. BSC’s vertical storage systems correct these problems and offer further enhancements to productivity. Let our team show you how our vertical storage products can take your storage to new heights. Business Systems & Consultants is a regional leader in material storage solutions. Since 1976, BSC has provided thousands of clients with state-of-the-art systems for managing, storing, and retrieving their high valued assets through the facilitation of our solutions, services, and overall expertise. Join the Business Systems & Consultants newsletter and get exclusive access to case studies, product spotlights, and much more.